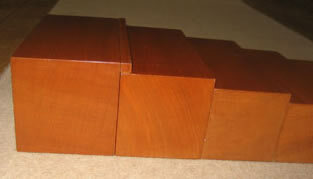 This material consists of 10 brown wooden prisms or blocks that vary in height and width and can be arranged in order from smallest to largest to form a stair. The prisms are all of the same length but the width and height ranges from 1 cm to 10 cms. The set comes with one extra 1 cm x 1 cm x 20 cm block which can be used to demonstrate that each block differs from the one that precedes it by 1 cm. Invite the child by telling him you have something to show him. Tell the child that for this lesson, we will need a mat. Have the child fetch and unroll a mat. Bring him over to the correct shelves and point to the Brown Stairs. Tell the child: "These are the Brown Stairs".